What can we learn from YouTube broadcasting the Presidential Debates that we can apply to marketing your own business? Brands will want to consider how they want to use politics to their advantage. As we learned in a previous Future of Engagement episode, politics can cause backlash to brands that can result in negative social media comments and lost business. “there is no bad publicity” will apply long term. Some people may end up remembering your brand much more clearly – but not remembering why – while others who are passionate about that particular issue may hate your brand forever. to become politically active in that manner. You could also create a platform for discussion, but have your brand stay neutral. In that way you can benefit from the high emotions surrounding politics, but not alienate any of your customers. That could be a real challenge to pull off – but if you can resist the temptation to express your personal or company opinion it could be done. As you can see from the graph below of social media mentions surrounding the Presidential debates, sentiment is positive – so you might want to find a way to tap into that positive interest to benefit your own brand. Click image to see larger, easier to read version. Social Media Monitoring can be used to ensure that whatever is being said about you, your business, brand or company is accurate so you can take action to head off any reputation issues. 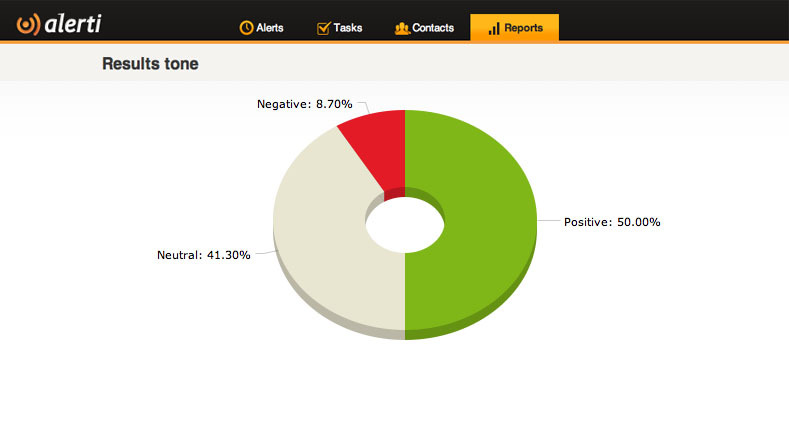 The graph above was generated using Alerti, one of the easier but still powerful social media monitoring tools. click that link and use Bonus Code alertivideo.